Erskine, Anthony J.. "Swallow". The Canadian Encyclopedia, 04 March 2015, Historica Canada. https://www.thecanadianencyclopedia.ca/en/article/swallow. Accessed 22 April 2019. The swallow (Hirundinidae) is a small family of birds including about 87 species worldwide, of which 7 breed in Canada. Cliff swallows construct nests from clay pellets in places sheltered from rain and runoff water (Corel Professional Photos). Sound of the cliff swallow (press the Sound button) courtesy Monty Brigham, Bird Sounds of Canada. Originally, barn swallows nested in caves or under cliff overhangs. 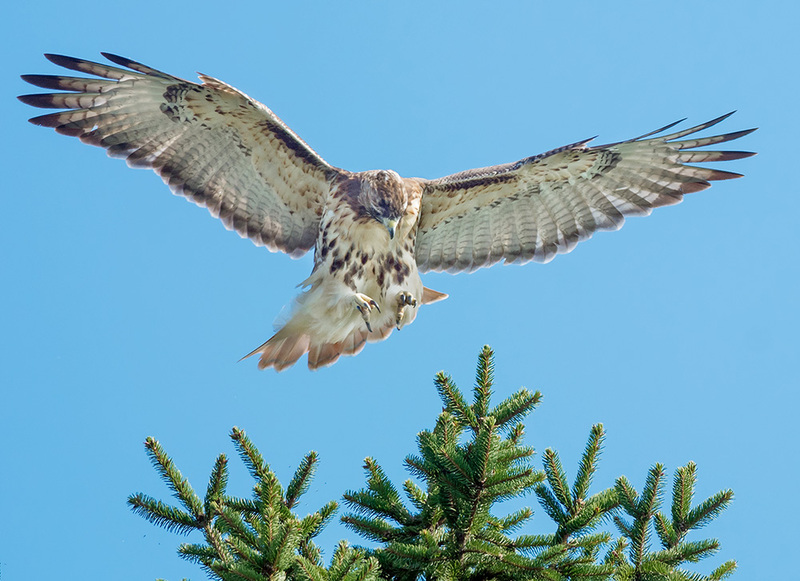 Now, they almost always nest under eaves or inside buildings (Corel Professional Photos). Tree swallows are early migrants, harbingers of spring (Corel Professional Photos). Sound of the tree swallow (press the Sound button) courtesy Monty Brigham, Bird Sounds of Canada. The swallow (Hirundinidae) is a small family of birds including about 87 species worldwide, of which 7 breed in Canada, including the purple martin (Progne subis). Canadian swallows do not sing but all have distinctive call notes. All swallows feed mainly on flying insects, spending much time in flight. Their long wings give the impression of a larger bird, but they are actually small. 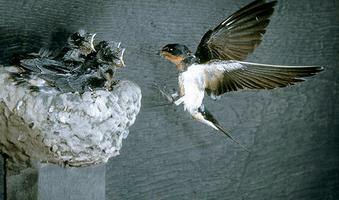 Many swallows are colonial, build nests in enclosed situations, and lay 4-6 eggs. In Canada most swallows rear one brood annually; in the West, barn swallows (Hirundo rustica) raise 2. 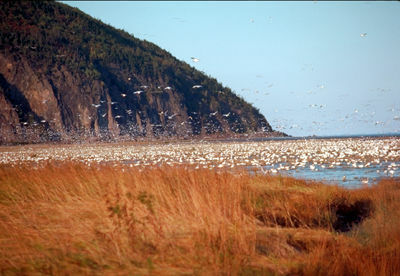 Several species nest around settlements. Native swallows fall into 3 groups. The brown-backed species - bank swallow (Riparia riparia) and northern rough-winged swallow (Stelgidopteryx serripennis) - nest in burrows in sea cliffs or riverbanks and in crevices in rock cliffs, respectively. Both range across the continent. Bank swallows are found far into the north and in Europe. 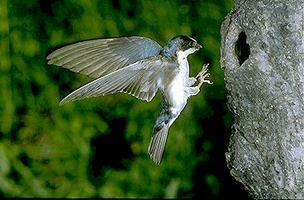 Northern rough-winged swallows enter Canada only in the south, ranging down to Central America. Tree swallows (Tachycineta bicolor) and violet-green swallows (T. thalassina) are early migrants, harbingers of spring. Both are iridescent blue-green above and white below. They nest in tree-holes or nest boxes. Tree swallows range across Canada, north to treeline; violet-green swallows are strictly western. Cliff swallows (H. pyrrhonota) and barn swallows are metallic blue above and rusty brown below. Both construct nests from clay pellets in situations sheltered from rain and runoff water. The enclosed, gourd-shaped nests of cliff swallows are under cliff overhangs or eaves. Originally, barn swallows nested in caves or under cliff overhangs; now, they almost always nest under eaves of or inside buildings. Swallows are accomplished, graceful fliers. In late summer, they mass in flocks on roadside wires, often several species together. 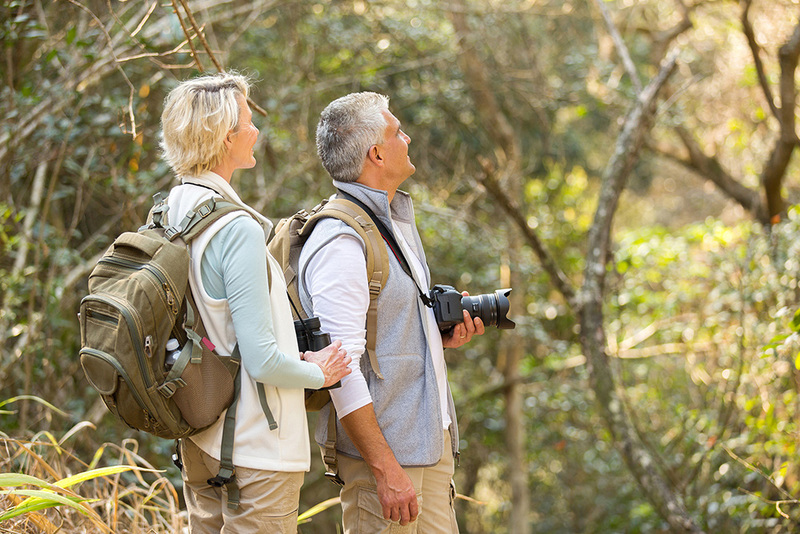 Within a few weeks they have gone south, not returning to Canada for 7-8 months.